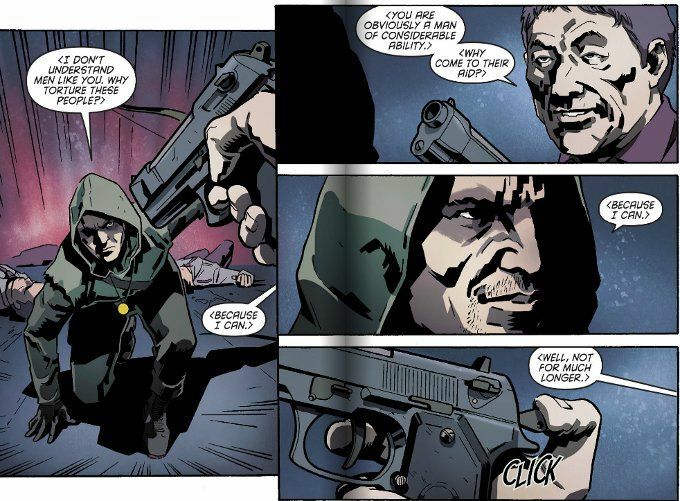 Arrow #13 sees Ollie taking another trip out of the country - this time traveling to the city of Shanghai. He takes care of his business with a local drug lord easily enough but quickly finds himself being drawn into local politics after seeing a boy being harassed by the police. Believed by the boy to be an agent of Xuan Wu - a Shinto deity known as The Mysterious Warrior - Ollie agrees to play Robin Hood for the boy and save his family from the corrupt police sergeant who has been extorting them for months. The script by Tiffany Williams is as informative as it is fun. I consider myself something of a mythology geek but I must confess that the deities of Shintoism are a blind-spot in my education. 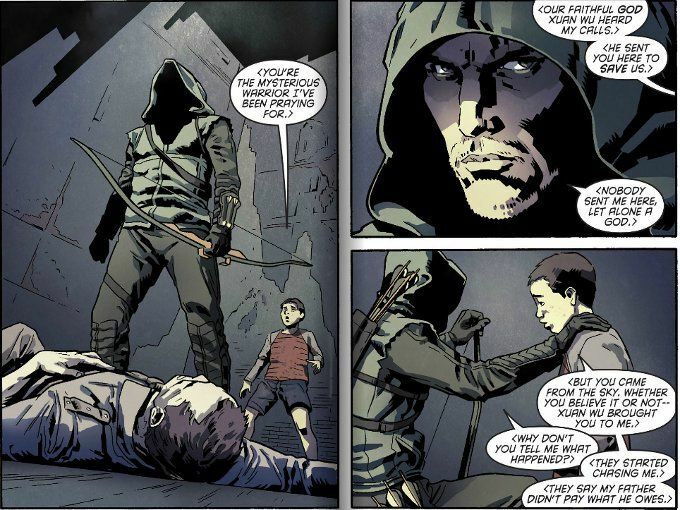 Reading up on Xuan Wu, I can't help but marvel at what a brilliant choice it is tie him to Green Arrow. In addition to the title "The Mysterious Warrior" (which is as good a description of Ollie in Arrow as I've heard anywhere), both of the myths involving Xuan Wu's origin mirror Ollie's own character. One involves a noble prince who was moved by the suffering of the common people and chose to fight to help them. The other involves a hunter who killed without remorse before seeking redemption. Even ignoring the mythology angle, Williams' script has some great character moments, including Ollie's perfect response to the idea of villains who do evil merely because they can. Sadly, the artwork by Sergio Sandoval and Pol Gas fails to live up to the promise of Williams' script. As before, Gas drowns everything in ink, ruining the fine detail. Then again, obscuring the details of Sandoval's pencils may be a mercy. It's bad enough that Sandoval fails to properly caricature Stephen Amell, creating an Oliver Queen who looks like a middle-aged man in some panels. But the story flow and visual storytelling are even worse. Despite the sub-par artwork, I'd still recommend this week's Arrow as a worthy download at 99 cents. The script by Tiffany Williams honestly is that good! If you're an Arrow fan, this should help you cope with your cravings until the new episodes begin airing again in two weeks.